tripped me with his puppy dog eyes as I tucked into my roast. 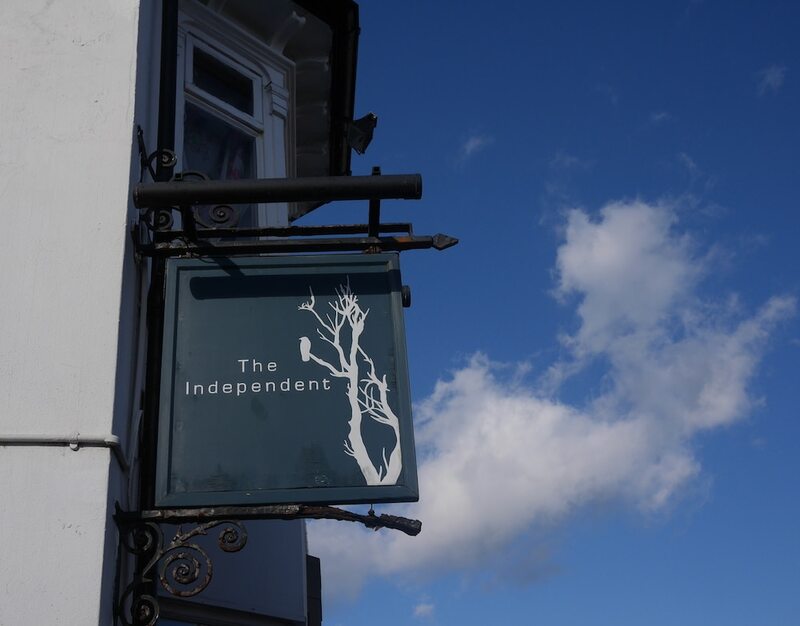 Close to Queens Park, The Independent has a little terrace out front, which was basking in sun when I arrived with my partner Tommy. 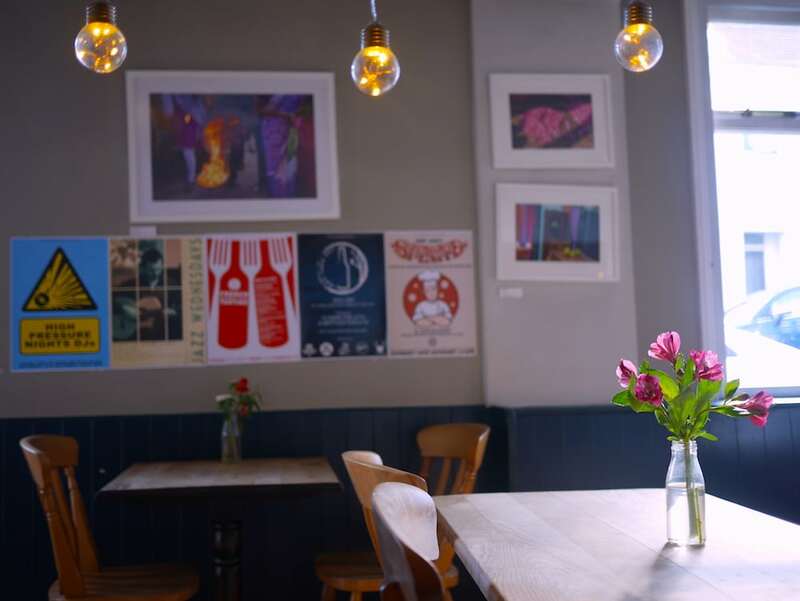 Inside, it’s semi open plan, with a choice of three areas to drink and dine in: the welcoming main bar; a back room with a big fireplace; or the sunny side-room where we were seated. The décor is a cosy yet contemporary combination of stripped floorboards, painted panelled walls and filament bulb lighting. The Sunday menu starts with a choice of aperitifs, from classic Kir Royale to their own twist on a Bloody Mary. 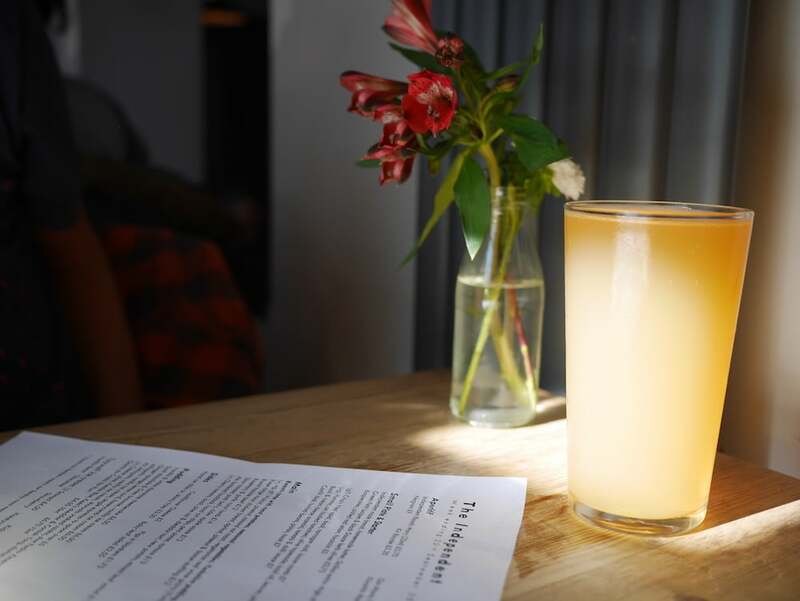 There’s a good selection of wines, including a white from Lyme Bay in Devon, while beers include local favourites and independent brews, like pale ales from Good Things Brewing Co. “The owners live just next door,” they told us behind the bar. 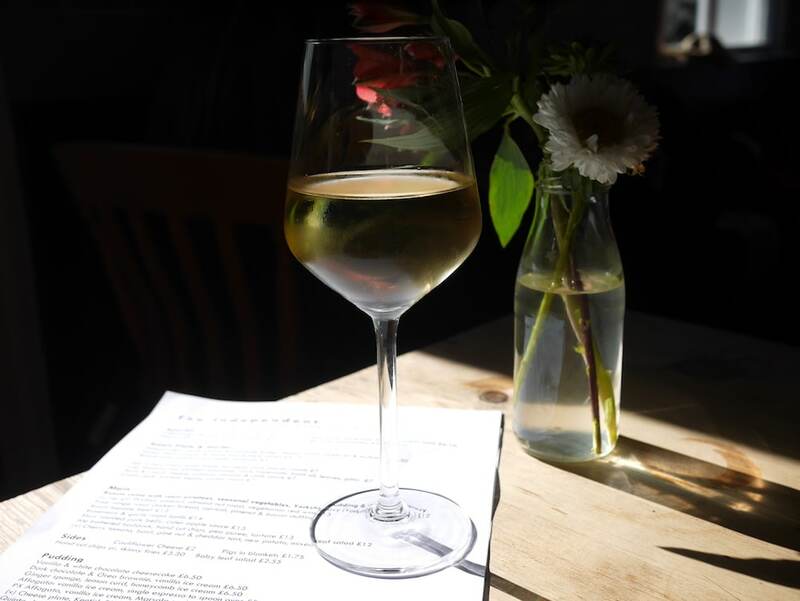 Tommy chose Siren Brewery’s ‘Suspended in Citra’ which, he said, tasted so fruity it was “like drinking a pint of orange juice – in a good way.” I went for a glass of Picpoul/Sauvignon/Vermentino – a clean, fresh and very drinkable white wine. To make sure we left room for a full roast with sides, we decided to share a starter. After discussing the merits of ‘crispy fried squid with bacon crumb’ and ‘basil and cream cheese arancini,’ we eventually agreed on the ‘confit duck.’ A delicately-presented plate of tender, moist duck was served, along with garlic- infused borlotti beans and pistou – a garlic and basil sauce that’s similar to pesto but more ‘saucy’ and less oily. Toasted thyme and earthy micro-herbs garnished the dish, and we used crisp sourdough to mop up every last splodge of that tasty pistou sauce. A big step-up from standard ‘pub grub,’ it’s obvious that Chef Sam takes his food seriously. 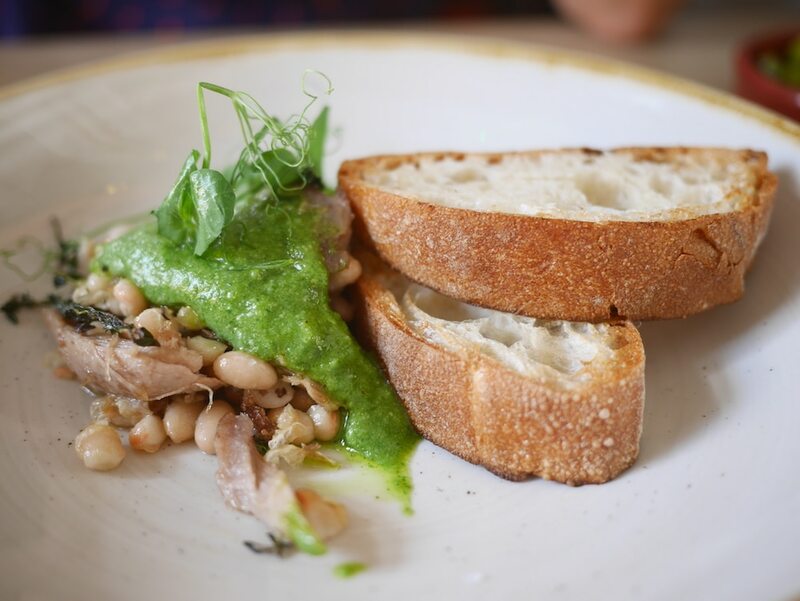 Based on this duck starter alone, we vowed to return for their weekday and Saturday night menu. For mains, we both went for a classic roast – beef for me, lamb for Tommy. 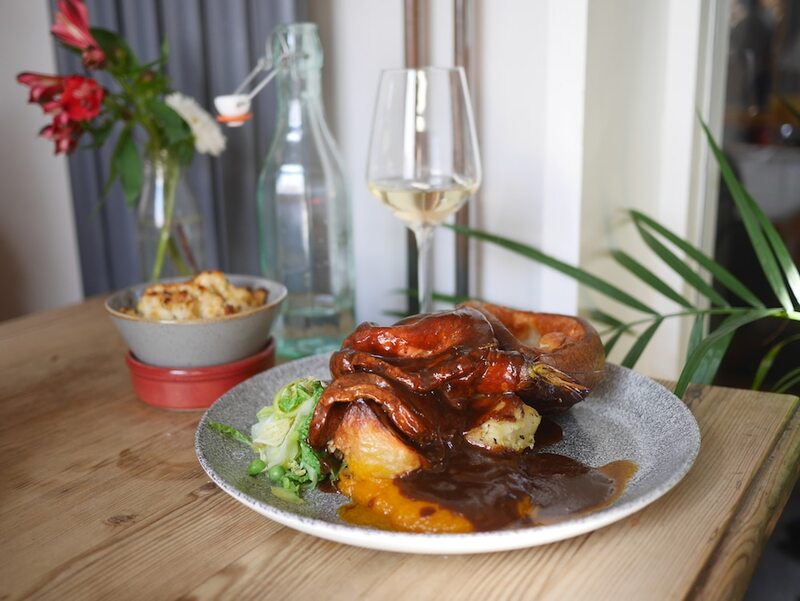 All roasts are served with seasonal veg, roast potatoes, Yorkshire pudding and glossy red wine gravy – mine was so shiny, I could almost see my face in it. Cauliflower cheese and pigs in blankets were optional sides. My topside beef was pink, and soft as you like. Beneath three thick slices hid a whole roasted carrot and a vibrant mix of al-dente leeks, peas and savoy cabbage. My Yorkshire pudding was elevated with chopped herbs, and my roast potatoes were crisp and fluffy in all the right places. Smothering my beef in horseradish sauce, I discovered more surprises: tasty celeriac mash and a beautifully smooth sweet potato puree. Tommy’s rosemary and garlic lamb with mint sauce was equally excellent and, thanks to a generous serving of gravy, this is the first time I’ve ever known him not to ask for an extra glug. 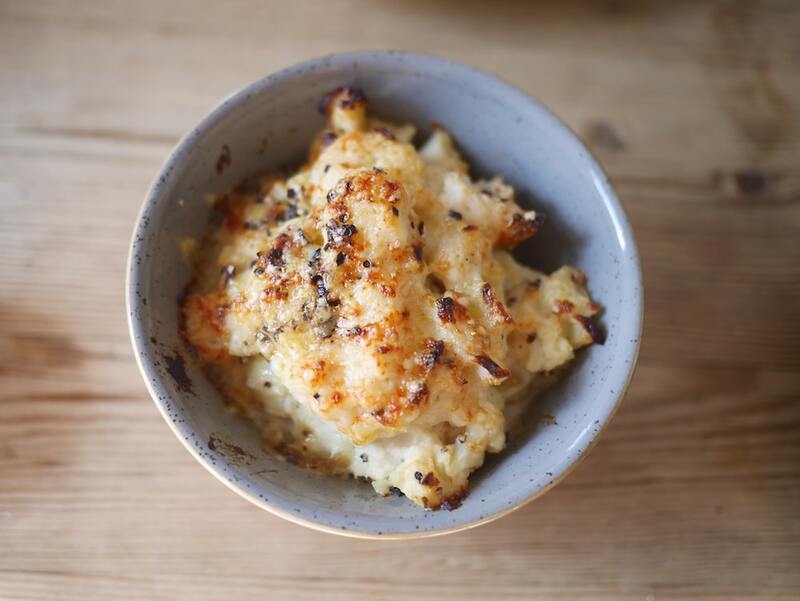 On the side, we shared a portion of cauliflower cheese, which had a griddled top and a good grind of cracked black pepper. Declaring himself ‘too full for pudding,’ Tommy ordered a mint and lemongrass tea, while I steamed ahead with ginger sponge. 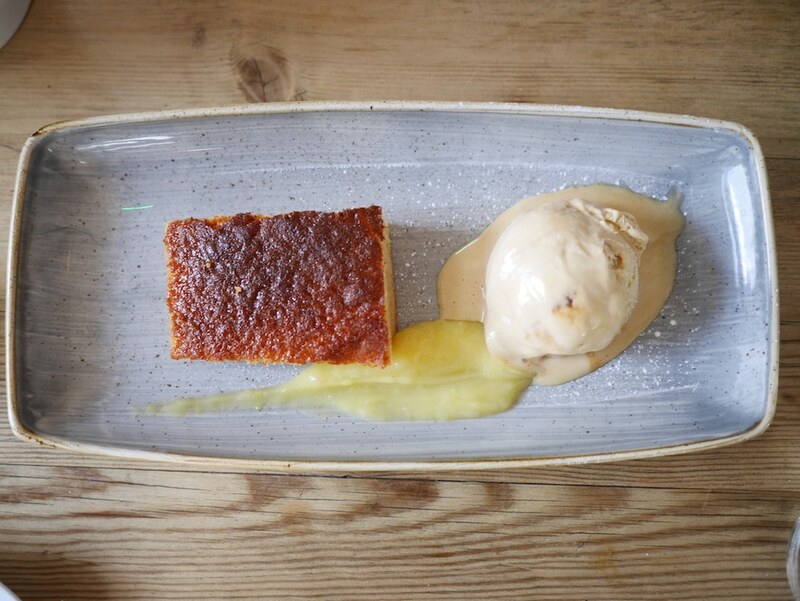 Soft and sticky, my dessert came with zesty lemon curd and a big scoop of honeycomb ice-cream, made with big chewy bits of honeycomb. Typically, Tommy couldn’t resist and started stealing scoops with his teaspoon. 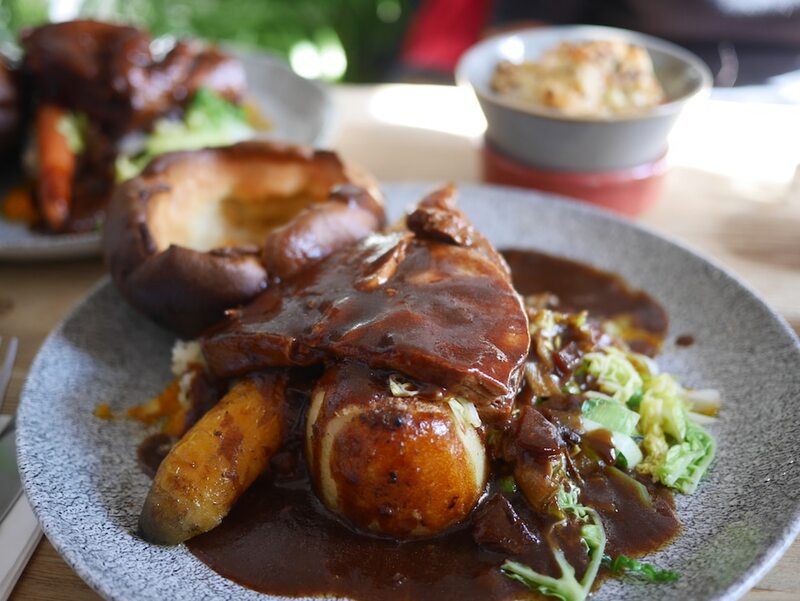 For me, this was Sunday Roast at it’s best: perfectly cooked meat served with lashings of gravy and an exciting variety of veg dishes that you wouldn’t cook at home. Dare I say, it was better than my Mum’s – but don’t tell her I said that! My only regret? I wished we’d ordered a side of pigs in blankets as well.